A Fun Giveaway with 5 WINNERS!!! Mixed Bag Designs contacted me awhile ago and once I checked out their site I knew this was going to be a super fun giveaway. Not only are their bags darling and re-usable, but there are going to be 5 winners!!!!!!! Mixed Bags has totes, gift bags, file boxes, laptop bags, duffel bags, iPhone covers, garment bags, cosmetic bags, grocery bags, and even stationary items. Their patterns are to die for cute! I loved looking through their online Fall Catalog. Check out the large zipper tote they sent me :) I use it to go to the pool since it is wipe-able and can get wet without any problems. You know how I feel about paisley! I also have this one that I take to church. Fancy smancy. One of the things that stuck out to me about this company was that they do a lot of fundraisers for schools. I would much rather support my school by buying a darling bag than wrapping paper :) If you are on the PTA or even just want to help out your kid’s school, you can get more information by emailing here dj@mixedbagdesigns.com. Speaking of school. . . they also sent me these super cool lunch bags for my boys. They LOVE them. Today is the first day of school and they were excited to finally be able to use them. We will keep things simple. You can do one or both of these. Please leave a separate comment for each one. 1. Visit their site and come back and tell me what you favorite thing was on their site. That’s it! Easy peasy. Good luck! I am excited to be able to pick 5 winners this time around. Wish I could do that more often. Have a Happy Monday! ***UPDATE*** If you want to make an order Mixed Bag Designs is going to give my readers FREE shipping!!! Just use teh code “HOUSE” at checkout :) Awesome. Do you want a Silhouette CAMEO??? oh that damask print – so classy & fun. & a bonus laptop case – awesome!! with the holidays (code for travel season) quick approaching, those bags would be perfect!! I “like”, well <3 them on Facebook!!! I love the laptop cases and really need one! The med totes are cute too! I love the iPad cases but also LOVE all of the patterns and colors. They have fabrics and patterns you just don’t see at retail stores. LOVE! I love the foldable storage!! The boxes would make storing things pretty as well as convenient! I was already a fan on FB, but I left a message for them saying thank you!! :) And thank YOU as well for hosting the giveaway. 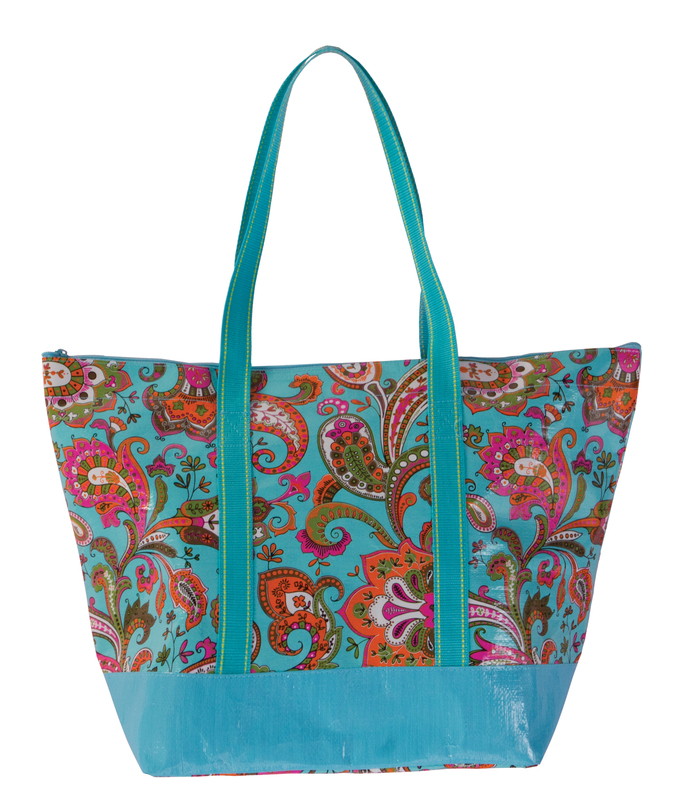 Love the big tote bags – the paisley is fun or maybe the blue and brown floral! I like the damask insulated grocery bag (http://www.mixedbagdesigns.com/Fall-2011/Insulated-Bags_5/NG100-DamaskBRInsulated-Grocery-Store-Bag). Wish I had one of these yesterday. I like Mixed Bag Designs on Facebook. Oh, these are all so fun!!! And I don’t know which prize pack I’d like more :-) Maybe “Downtown” or “Around the House.” But, probably my favorite item is their “Hold Everything” bag in the blue/brown flower… I could do SO Much with this! Thanks, I’m crossing my fingers!!! I would LOVE the black swirl lunch tote OR the damask insulated tote. I love the designs and patterns for these awesome bags! Thanks for a great giveaway! Ps. I’m not on FB anymore (I know, I know…. A total shock!) But if I were I would thank them too! I love this BT112 Blue/Brown Flower Large Zip Tote! 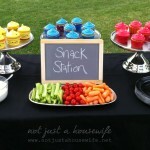 We are always going on outings and this would be great for all the kids’ stuff! “Liked” Mixed Bag Designs on Facebook, and told them thanks! I cant name one thing! I have to say I am in LOVE with their prices! I also became a fan on facebook. Christmas is on its way and I know where I am ordering some cute bags from! Thanks! Visited Mixed Bag Designs website. I really like their Guy Stuff. Cool “dude” colors! I love the Aqua Paisley Large Fold n Hold. Favorite item is the Damask large zip tote! I love anything in that dotted swirl pattern! OOOOhhhh, crossing my fingers and my toes …. I think that the Pink/Black Plaid Large Zip Tote is just beyond cute. So love this. I don’t see anything that I don’t love but really need some of the Fold N Holds and love the insulated grocery bags. All the prints are fabulous! I already like them on Face Book. I would love one of the Insulated Totes for when I buy Icecream at the store or a Medium sized Tote just to haul all my stuff around. I love the around town collection. Especially the Blossom and Blue Leopard grocery bags. Love this giveaway! I would love some grocery store bags and the weekender or something to use as a diaper bag. I LOVE the medium tote bags!!! I just returned from facebook. “Liked” their page and left a comment thanking them for the giveaway! Also visited your facebook page and “liked” it as well. Will add you and them to my homepage favorites! Thanks for this fun giveaway. I went to their facebook paged and “Liked” them. I totally need an insulated tote– I always use my reusable shopping bags, but don’t have an insulated one yet! I like Mixed Bag on Facebook! I LOVE the aqua paisley file box, large zip tote and the drug store bag. I love their large totes and their laundry baskets totally awesome! WOW, what a great giveaway! There’s NO WAY I could choose just 1 favorite bag from their site. They have too many fabulous prints and bags to suit any and all occasions!!! If I had to choose 1, it would be the laptop cover…I don’t have one. :0) Thank you for the giveaway! I ‘liked’ Mixed Bag Designs on Facebook. I like the black swirl hipster. Thanks! I like Mixed Bags on facebook. Thanks! Oh my goodness, I want one of everything! I love the ipad cases and all the travel stuff. What a great website! I like their File Box. That would be great for taking stuff to/from the office! I like Mixed Bags on FB! What cute bags! I went and checked out their website, I really liked the foodies. Reusable sandwich bags, genius! I liked them on Facebook (Always JUst A Mom)! I LOVE the Damask tote bag!! So cute! I also liked them on Facebook! 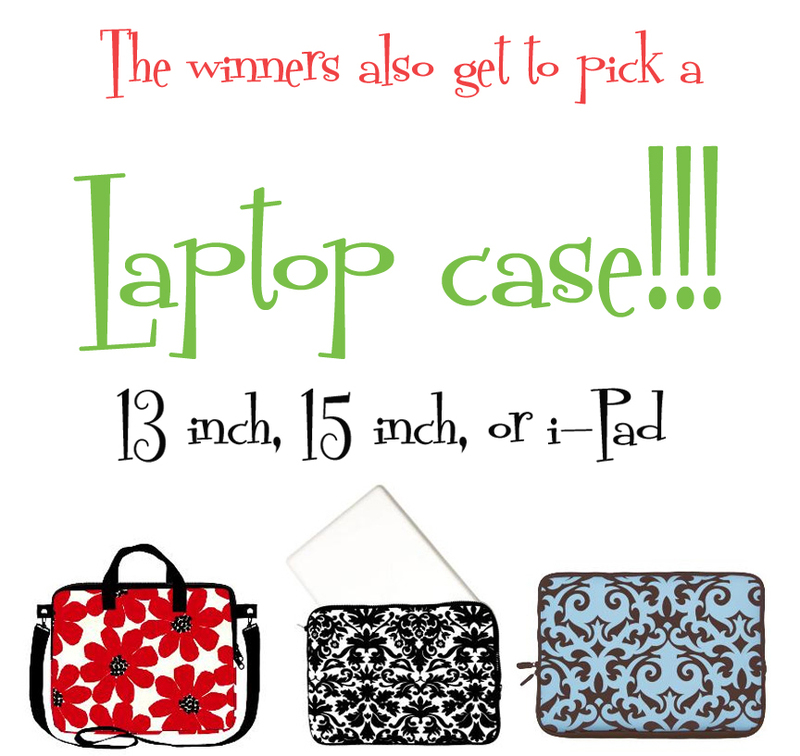 I love the damask laptop case! I love the damask file box–what a great idea! 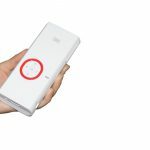 Wow… they have some awesome looking products. Love the lunch totes and foodie bags… the storage boxes, the hangup bag…. everything! 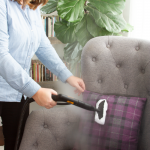 Loving the damask fold and hold – lets see I need one in the van, several in my office and a large one for taking meals to pregnant/new mommas….oh, but the totes, the library, shopping…road trips, knitting….this could be dangerous. I love the foodie bags. I’m really big into reusable bags right now and I love their stuff! OMG! How adorable!! I love the foldable storage boxes! The Damask print is amazing! Love it!! Thanks for a chance to win!! I am keeping my fingers crossed!! They had so many cool things on their site! I’m loving these bags!! I liked them on facebook! My favorite is the Paisley Large tote, so cute!!! I love the Weekender bag in Blossom! I love all the grocery store bags – especially the blue brown flower design. So much better than the ugly ones that I have! I love the Damask large zip tote! I liked them on Facebook! Thanks for the contest! The Blossom Duffle Bag is super cute! Thanks again! Love the weekender set! perfect! the black and pink daisy design is my fav, i love their products! Wow! I love the idea of a super cute pool bag. I like the large zip beachball print tote. And they are only $20! The lunch bags are super cute, and I like the zippered large totes…so many cute options! Thanks to both Mixed Bags Designs and you for this giveaway! Just liked them on Facebook. I like the fold-n-hold boxes! Thanks for the entry! I love the pink and black plaid large tote…and the blue and brown flowers. It is really hard to choose just one! Very cool contest! Thanks for turning me on to Mixed Bag designs. My favorite is the HE112 Blue/Brown Flower Hold Everything. I love, love, love blue and brown together and the size is great!!! I like the duffle bags or the makeup cases the most- so cute!! I absolutely love the blossom duffle bag and the damask large zip tote bag. Great bags! I like Mixed Bags on facebook! Liked them on Fb and left a comment there! I love the pink plaid pattern, or the blue and brown flowers patterns. I love all the designs and the different sizes of totes. So cute, fun and useable for everyday! Do I have to pick just one?? I love the weekender and the thermal insulated totes! They would be great for a fun road trip! It is between the Hold Everything Bag and the Duffle Bag. So many great options but I like Big! What a great giveaway!! I love the large zip tote bag…ok, so there isn’t really anything I don’t like on their site, but I think that tote would be great! I love the medium poppy print tote and the reusable plastic baggies – those are brilliant. I have been looking for alternatives to use in the kids lunch bags. Thank you for sharing the site with us. 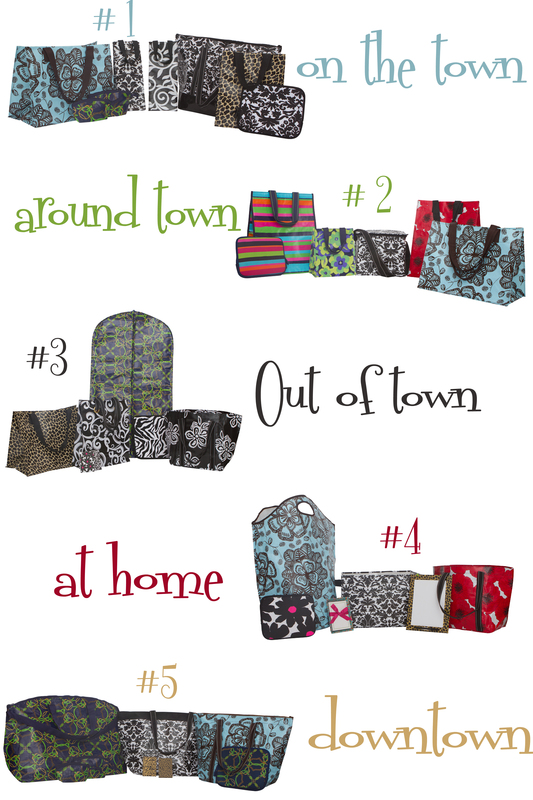 I liked Mixed Bags on facebook and love all the totes and the out of town set! To be honest I love everything in the catalog! I liked them on Facebook! Even if I don’t win I think I will probably buy some bags. I have been looking for something like this at an affordable price since my last bags have fallen apart. I love the Damask Design especially in med tote and weekender tote size. I also could not pass up the Dot design! Loved it! And the beach ball design large zip tote would make such a fun swim bag! Way too difficult to choose just one. Thanks for sharing Stacy! I liked Mixed Bags on Facebook! I really liked the weekend zebra bags, so cute! I love their foldable storage containers. I just got my first teaching job and cute, colorful storage containers are WAY more fun than regular boxes. I also love their thermal insulated totes & coolers. I’m 18 weeks along with our first baby so those would definitely come in handy! 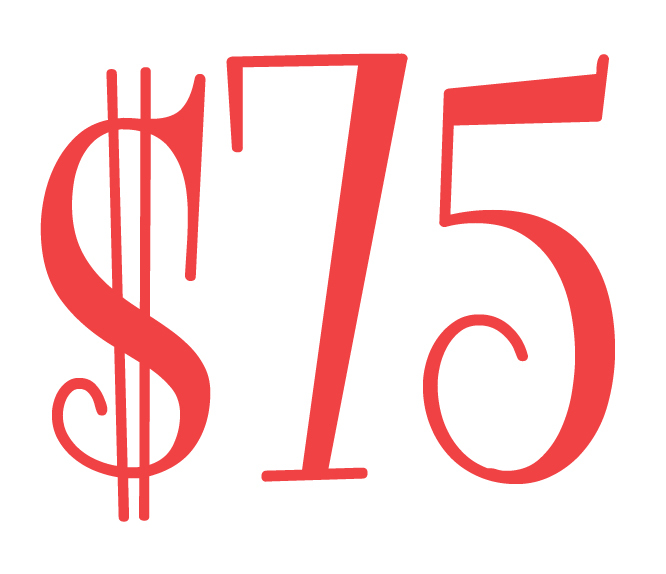 It’s awesome how affordable all their products are compared to other companies, too! 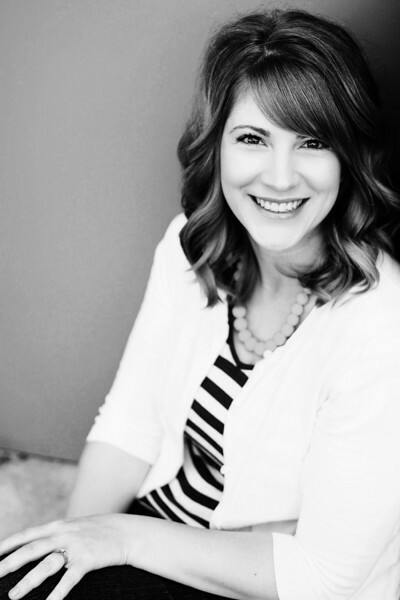 Hoping for my first blog win!!! These are adorable! Love the material designs. Keeping my fingers crossed and sharing this page with all my facebook ladies. I love everything, but especially the box store bags and foodies. I let them know that I think their catalog is gorgeous! I love the insulated lunch bags. School starts for my kiddos on Monday and they would love to have actual lunch boxes instead of brown paper sacks or grocery bags! I liked Mixed Bag Designs on Facebook. I would love the Out of Town package…very nice stuff! Hlmmm, I think I like anything that’s in their paisley patterns! And now I “like” them via FB too! I like the paisley print or the blue and brown flower. Any size tote would be my preference! Just liked them on facebook. Great giveaway! I’m loving the medium tote – the black one with white “painted flowers” and all the rest of their stuff too! What a great company! I just love all their wine bags! Too cute! Thanks for the giveaway! I like the insulated grocery totes. I need one of those—my frozen stuff always melts in summer by the time I get home. Just liked them on facebook. That is an awesome giveway!! I really like the Blue/Brown Flower Hold Everything Bag! I “liked” them on facebook! Lovely site! Love the hold everything bags! I’m always looking for cute bags to stash things. I love the “Hold Everything Bag”! It would be great for so many things…clean laundry, shopping expedition, beach time, sewing projects, etc. Love the foldable storage and the laptop cases! Thanks for the giveaway! I think the damask medium tote is so cute! They are all CUTE! I love the duffle bags!! I love their notepads and paper trays. What great gifts they would make! I LOVE the iphone cases (especially the paisley) and the lunch totes. Who knew lunch bags can still be so fun and stylish for grown ups! I have happily LIKED them on Faceboook now ! I want one of the hold everything laundry hampers. I liked them and left a thank you!! I love the Blue/Brown Flower Large Zip Tote. I could sport this everyday. Thank you both for the generous giveaway! I liked Mixed Bag Designs and left them a thank you on their wall. I love the large zippered totes, especially the Blue/Brown Flower print! I loved the little lunch bags, the camo one is perfect for my son! I “liked” the Mixed Bag Designs on facebook, I am so excited for this giveaway, definitely could use an Ipad case that is so dang cute! How exciting, I sure hope I win!!! I LOVE the black daisy large zip tote! The blue brown hold everything,we homeschool and when we leave this is what we need.The camo lunch bag is perfect for my little hunter. I love the foodies and blue paisley lunch tote. I like the black daisy duffel. Such cute prints! Love the damask tote bag! Also their whole lunch line is awesome! Okay, there’s no way to pick ONE favorite. I’m diggin’ the medium totes and the grocery bags. The wine bags would be fun for the holidays. And my son is starting kindergarten next month, so the lunch bags would be fun too. i love, love love,their bags, everyone of them are very useful! l love the weekender and the tall totes with the zipper inside, would love to have the large tote that zips! As for colors they are all very cheerful! I love the foodie bags and the hold everything bag. I like the tall totes. It would make the perfect library bag! Fun giveaway! The iPhone covers are precious! Blossom, maybe? They are all cute. I love the insulated grocery store bags, especially the pink/black plaid. I love the insulated bags! Specifically the damask print! So cute! Love Mixed Bag Designs. My favorite is Blossom. Thank you for the chance to win! Fabulous Fabric! I love all the options. I especially like the reusable sandwich bags and the zippered pouch (you could use it for diapers and wipes and throw it into whatever purse you need). I will be recommending this to the PTA because I love functional items compared to chocolates or wrapping paper fundraisers. What a great giveaway Stacy! Thanks for sharing about Mixed Bag Designs! I like MBD on facebook, as obSEUSSed. I like the grocery bags! I’m trying to go all green when I grocery shop! I like their foldable storage containers in so many pretty colours. And I just ‘Liked’ them on Facebook … what a great giveaway! Thanks! I love the foodies bag. I like the black daisy tall tote! I love the “Pink Flower” hipster bag. Love the Holds Everything Bag in B&W Damask! Liked Mixed Bag Designs on Fb. I like the English stripe iPad case. I love the Lunch Totes! How cute are they? I like the hold everything bags! I already “like” Mixed Bag Designs on FB. I really like the foldable storage options. I have been looking for something pretty like these for my linen closet. I just ‘liked’ Mixed Bag Designs on FB. There is nothing better than being able to get the basic necessities in your life in fun colors and patterns. 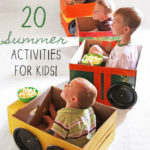 Their website is so full of “fun” stuff, I couldn’t get enough! I just “liked” them and posted a thank you on their FB site. Excited to know about them now. Thanks for spreading the word! I love the Beach Ball Medium Tote. So cute! I love the blue brown flower tote. You can never have enough totes. I liked mixed bags on FB, they are pretty cute. I like the large zipped totes. I have been keeping a small purse inside my tote bag so that I can keep the purse stuff separate from all of the other things I carry around!! Love the blue paisley print! i love all the bags, I could sure use the weekender or duffle bag for my classes I teach at the gym. i visited their site and I love the bold bright colors esp the beachball ( looks like fun) and I love the peace signs. I like them all. i would love to try the hipster and the sandwich bags out. Love the red plaid duffle bag. Fun stuff! I LOVE it all! Lol! But I really need a laptop case and love the leopard or blue Provence! I also love the file tote!! I am a Mixed Bag Facebook fan too!! I liked mixed bag designs on facebook! I like Mixed Bags on facebook. I love the large zipper totes, Blue/Brown Flower pattern caught my eye. I “Liked” Mixed Bags on Facebook. I really like the foodies (reusable baggies). Such cute designs for boys and girls! I love their foldable storage and duffle bags! Love, love, love the lap top case . . . Liked “Mixed Bag Designs” on facebook and thanked them for a super giveaway! I love the supply cases. I like small bags to put little things in so they do not get lost in a big bag. My favorite thing is all of the beautiful prints! It would be hard to choose one favorite! I liked Mixed Bag on Facebook!! I like them all! I can’t choose a favourite. How about one of each?? Love the damask print bag. I love the Bahama Floral Laptop Bag! I “like” them on Facebook. Thanks for hosting the giveaway! I love the foodies, I’ve been wanting something like that for a while. I think my favorite print of the choices has to be the black swirl. I love the lunch totes. I’ve been looking for one and these are so reasonably priced. I love the duffle bags! The black flowers with the blue patten is my favorite. I can’t believe how inexpensive their products are. I love what they gave you and your boys..very nice! Thank you for the great give away. Someone is going to be very happy(well 5 someones)!!! I liked Mixed Bag Designs on FB. Love the duffle bag and paisley tote! Great for a fundraiser. Thanks for the idea and giveaway! I love the Ipad cases! I din’t have one but I think it would be a great idea to drop a hint for what I want for Christmas! Also those hold everything totes look like they would be awesome for summer toys! I love the duffle bags. Cute cute. And I always need one when I go on vacation. I like Mixed Bag Designs on FB. I love the damask print and the laundry hamper, the lunch totes, and although I don’t travel much, the garment bag is to die for. thanks for the giveaway. already have “liked” them on fb. Love, love, love their prints! I’ve been looking for a really pretty case for my iphone and now I have two that I love to choose from! I just can’t decide… black and white damask or colorful paisley? Maybe both. I’m a fan of MBD on FB, and I left a message. I love the blue/brown flower – Hold Everything and the leopard Hipster. Love everything!!! I especially like the foodies bags adn the Hold everything! They are ALL so cute! Love your church bag- I’m a big fan of black! Thanks for the giveaway!! I “liked” their page & visited their site too. There are so many things on there I like but I think the Duffle bag in Peace/Love was my fav! I love the Blue Provence iPad case. I also love the Blossom and Black Daisy duffle bags which would be great for carrying my dirty uniforms home from work. I “liked” Mixed Bag Designs on Facebook. Loved all things Damask! so of corse Love it all. I couldn’t make up my mind so I had to go with both the Damask Cooler & Damask Garment Bag. the Cooler would be awesome to place my Cupcake frosting in to keep it cool and pipe on site. the Garment Bag is just a great travel piece and you totally would know exactly where your items would be while still looking Great. I am supposed to tell you about only one thing I loved?? What a great site. Loved the foodie bags, the carry all that they used for laundry (I now use an IKEA bag since I hang clothes outside) and the large totes are great. LOVE, love their paisley print. Thanks for the opportunity to win!! I liked Mixed Bag on Facebook. I love the pink leopard medium size tote, but I really love everything on that site!! they all looked great, but I really liked the medium totes :). They look idea for so many things. I LOVE their lunch boxes! So cute!! I love the HOLD EVERYTHING bag! Checked out their site and LOVE the pansy bag. My daughter really needs a laptop case as she is going to college in a few days. She would really like the Blue Provence Neoprene Laptop Case. She would also like the Blue/Brown Flower Hold Everything Bag for a hamper and laundry. The foodie bags are awesome! The Christmas bags are also a great idea! I love love love the snack bags! So cute! I love the Blue/Brown Flower Insulated Grocery Store Bag! What a great giveaway… The large zipper totes are fabulous! 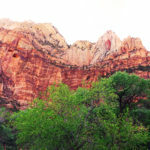 I liked “Mixed Bags” on Facebook! I love the hipster bags! Gorgeous designs! I am loving the English Stripe pattern. I could take one of everything! The iphone cover and insulated bag are really appealing to me, as well as the duffles for my girls. 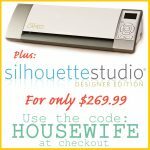 This is such a fabulous giveaway! I really need some bags – I was just putting that on my “to find” list. Hope I win! Liked on facebook, and Love the lunch bags- so cute and handy! I love the love totes and I liked them on facebook. I LOVE the hold everything in blue daisy! I also follow mixed bag designs on facebook! How can I even choose!! i love it all…I really like the stationary set and I like the whole damask collection! Love it all!! I liked their Facebook page and left them some comment love! I am so torn between the Out of Town and the Around Town, they both have great items in them. Would love to win one. I L-O-V-E the “tall tote” in the Mixed Bag Designs catalog! I am an RN and haul lots of stuff between home and the hospital….I end up carrying my purse, lunchbox, and small-ish tote bag….I usually look like I need an extra set of hands. :) I think the tall tote would be a perfect size to fit everything in one spot. The chocolate and pink would be my pick! Thank you for the chance to win! I also “liked” Mixed Bag Designs on FB! I LOVED the damask print large tote bag. I’d LOVE to win this giveaway! Thanks! Love the Damask garment bag. It will be perfect to put the temple clothes! Love it!!! I looooove the blue/brown hold everything bag…so chic! I love the damask large zipper tote! I “liked” the Mixed Bag site on Facebook and thanked them for the giveaway! I love all of the boy lunch totes! Cute stuff! I liked and thanked them on facebook! I love all of the laptop covers! SO cute! Loved all the bags! My favorite would have to be the Tall Tote bag in the Block Swirl pattern. I like Mixed Bag Designs on FB. :) Awesome giveaway! I really like the laptop covers! I love the foodie bags. I have been looking to buy some reusable ziploc baggies- I hope I win!! I liked their Facebook page! I would love the Blu Silver zipper tote! Hoe you pick me! I love all their stuff but my favorite was the blue province laptop case! Loved the Iphone and Ipad cases. Thanks for posting the link. My favorite thing is the “Hold Everything” totes for laundry! They would make it super easy with my 6 kids! I “like” Mixed Bag Designs on facebook! I love their weekender zip totes!!! Love the Around Town group and the iPad cases. I could really use an iPad case. Thanks for the give away. Oh I’m lovin’ that GB100 Demask lunch bag and that ST101Demask paper set is too fabulous! I know, I know, I’m only supposed to pick one, but who could?? I love the Foodies reusable food baggies and my daughter would love the hot pink floral one! I really like the Navy Stirrups Big Travel Bag – I need a new travel bag! I just got a new iPad, so an iPad cover is my FAVE! I like the the Hold Everything bag in black daisy! I love what comes with the DoWnToWn set. All of the prints are so fun and stylish :) Its awesome to see how many people participate in posting comments on this blog and on the Mixed Bags Facebook site. The posts are so much fun to read. I would love to win one of these sets!! I like Mixed Bag Design on FB! I love the paisley pattern large zip tote, I love paisley and huge bags I can throw all of my stuff in for the day. But I also really like the cute reusable snack bags, so much more environmentally friendly and cost effective than plastic sandwich baggies! I love the insulated lunch totes! 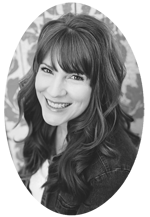 As the mom of seven children, I LOVED the laundry totes…could be good for toys, too! Did you see the pink print they call Pink Zebra? To me, it looks like falling pink petals! My phone wouldn’t let me comment (I’ll do that later) but I did “like” their Facebook page! I like their Painted Flower medium tote, it looks like it could be from Hawaii! I was already a fan on FB! Love them! Love the laundry hold all totes and large zip tote : ) Very clever and fun designs!! Liked them on FB too!! That blue and brown print!!! I need that in my life! I loved their tote bags, especially the red plaid Tartan style one. I’m always needing a new tote bag to haul stuff from the store or to throw all my stuff in when I go places. Looks like a great giveaway! It may sound silly, but the things I like the most are the insulated lunch bags and the foodie bags! I’m so excited about them! I like MixedBags on FB! Thanks for the chance to win! I liked MB on Facebook! I think my favorite item is the English Stripe iPhone case! Lame, I know, when they have so much other cool stuff (and it was VERY hard to pick a favorite) but I’ve been looking for a new case and that’s perfect! I like Mixed Bags on Facebook! I love the variety of their patterns and designs. Subdued for those subdued occasions, loud for those splashy occasions! MB107 black and gray striped man bag – love it! I love the clothes hamper bag! wow neat company love the insulated bags I have been wanting to get one for a while now. also liked them on facebook thanks for the give away! I just “liked” Mixed bag designs on FB! so excited about this giveaway! My girls would have a hay day shopping for bags. Personally I have a thing for the boxes. I love to be able to put junk in a cute box!!!! How can you choose, as I was looking through the range, I kept saying to myself, Oh I Love That! However as I have started by Christmas Sewing I think the gift bags are adorable, and who wouldn’t want new Storage Boxes? I like the duffle bag and the foodie reusable baggies. Cute stuff! I love the black daisy tall tote and damask medium tote! I like (actually, love) mixed bag designs on Facebook! My favorite print is the damask and I can’t decide between the weekender, medium tote or tall tote. They’re all just so cute! I love the Red Daisy medium tote!! What fun colors!! I “Liked” Mixed Bag Designs! I like……so many, turq with pasley, mixed bag design and the red flowered laptop bag….. I love the Foodies. That is such an awesome idea! I just “liked” them on facebook and commented. Love the foldable storage ! Anything damask works for me! Love the insulated lunch bags! I liked them on Facebook, although I love them! I love the medium totes, big enough to hold things, but not to big to carry around. There are so many choices in patterns it’ll be hard to choose just one. I love the iPad case! I really love it all andwith 2 kds could use a lot of it! Great company I see orders in my future!! Thanks for introducing us! I see a great friendship coming for them and my bank account! I liked Mixed Bag Design on fb! I like the department store bag in blossom! I love everything and have visited their site many times. I think it would be a fabulous fundraiser for our schools. I also liked them on facebook! SO MAY GREAT THINGS! But I love the leopard or damask garment bags! I’m a follower of Mixed Bag on Facebook! I have a need for a laptop case – and will put their site on my Christmas list for gift giving! I like to be unique. WOW what great bags and organizational ideas! I have been looking for a file box/tote for a long time. The Damask print is awesome. I also like the box store totes, even though I am afraid I would fill it with my stash yarn ;) Liked them on facebook so I can follow them as well. 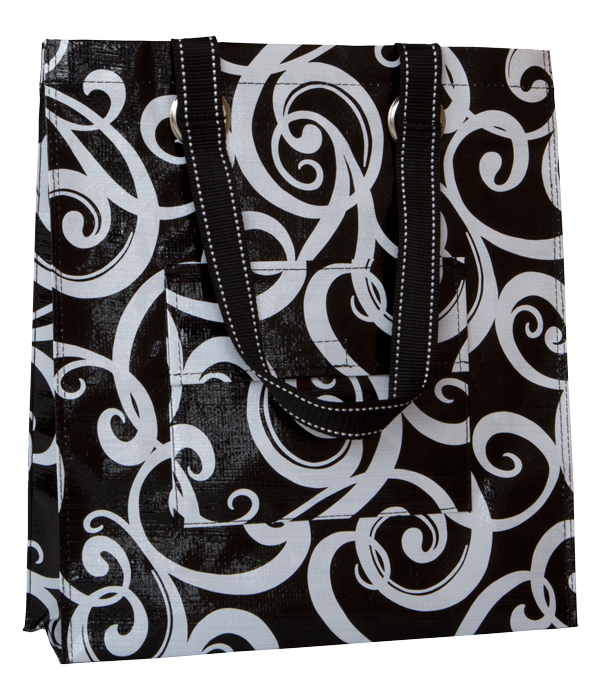 I love the Tall tote in black swirl! Okay, so there are SO many cool things on the Mixed Bag website that I’m having a hard time choosing just one thing to mention. For some reason I’m very fond of the pink plaid department store bag, though. But then there are the laptop cases, too. Oh dear me. And the hold everything bins – SO cool!! Alas, I cannot pick just one item. What a great site and products! With more kids in school now the lunch totes and foodies are very appealing, no more plastic bags! But since I have several small kids & have never gotten out of the diaper bag phase the totes are practical, affordable and cute to mix things up! Thanks for letting us know about them. I like mixed bag designs on facebook! yay! I love the black swirl bag too. But I love, love, love the idea of this being a fundraiser instead of cookie dough!! Such a good idea. I like mixed bag designs on Facebook! I LOVE the hold everything bag and definitely the laptop cases! Oh man, I need one of those! I love the pink plaid duffle bag! Love the classic leopard zip tote and the leopard Iphone cover! 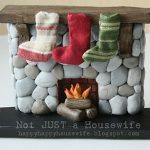 I liked MixedBagDesigns on Facebook. I love the large zip tote in the black daisy design! I’m so glad I decided to stop by here today! MIxed Bag Designs is so cool! I liked them on Facebook. I’m looking at their website right now. I wonder what I will find. I love Mixed Bag Designs. I like their shopping bags. My husband and I always looking for good, reusable bags to take shopping with us. Also, I really like the reusable sandwich bags. I ‘Liked’ them on Facebook. I love their shopping bags (we are always looking for reusable bags) and thei reusuable sandwich bags. I’m all about reusable bags! I love the tall totes, the foodies and the hold everything totes are my favorites. SO had to choose. I love the lunch totes and reusable baggies! Love the damask large tote. It would be great for a church bag. thanks for the chance. I love the foldable storage and the weekender! In ALL patterns…one of each please! What an awesome givaway! I love the large zipper totes and love the coral camo patterns… what awesome colors. It really is hard to choose a favorite, too many cool things. I like those tall totes! The red one, is beeaautiful and I love all the different damask ones. The foldable storage boxes are cool too! When is the drawing. Such anticipation! Thanks again for the chance to Win. Love the On The Town set! Love the Hold Everything bags. Would be perfect and adorable to send to college with my daughter for her laundry. I have a new macbook and I love those super cute cases! Also the small makeup bags…great designs and prices…. I love the zebra print laptop case! and i love the size of their weekender bag. so useful!! I loved everything so much, but what I loved best was that their prices are so reasonable! I about keeled over from seeing how affordable everything was. I think I’d love to start with one of their duffles, but I’m afraid I’ll be going crazy on other stuff as well. Just letting you know that in addition to checking out their website, I’ve liked them on Facebook. What a great company, thanks for brining it to our attention! LOVE the Blue/Brown Flower Large Zip Tote!! I absolutly love everything on mixed bags but the weekender is fabulous!! Oooh, it’s tough, I liked the fun prints for all the bags, and I liked the storage options they have! I liked them on Facebook…Thanks! I know it’s early, but I LOVE their Christmas bags! I “need” so much from their site! Love the laptop covers & reusable foodie bags! I also “liked” them on facebook! Thanks!! I love it all, but really need the paisley cosmetic bag. I liked Mixed Bag on FB. I love the large zip totes. I have so many bags that size and use them over and over. I also love the patterns/colors to choose from. They are so bright and happy. So much cuteness! I love the travel bag in leopard print. Also, that Hold Everything bag looks amazing! I think the black swirl hipster would be perfect for me :) LOVE all the sets!! What a great giveaway!!! “like’ them on FB :) How could I not?? i am loving the large zip tote bags. i’m getting ready to have two under two and i think that style of bag would make a great diaper bag! I’m loving the thermal totes in Damask!! We have long drives between grocery stores and how wonderful and cute would these be to transport in!! Also, digging the gray strip men’s garment bag and the foldable storage….Lovin’ it!!!!!! THE LEOPARD PRINT FOR SURE!! !